Welcome to our enormous selection of Rainbow Castle outdoor swing sets! 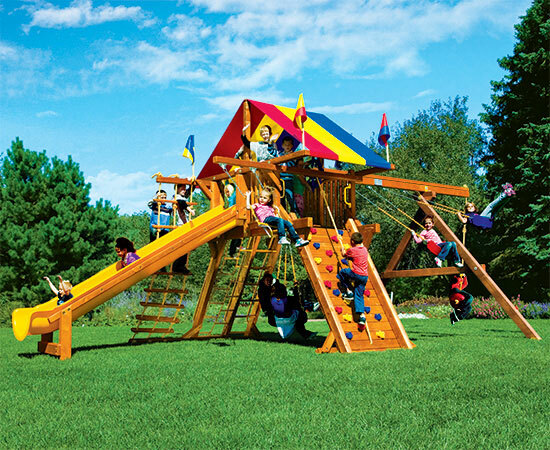 The Castle style outdoor wooden swing set is an open play design that produces an abundance of space to climb, slide, and swing. 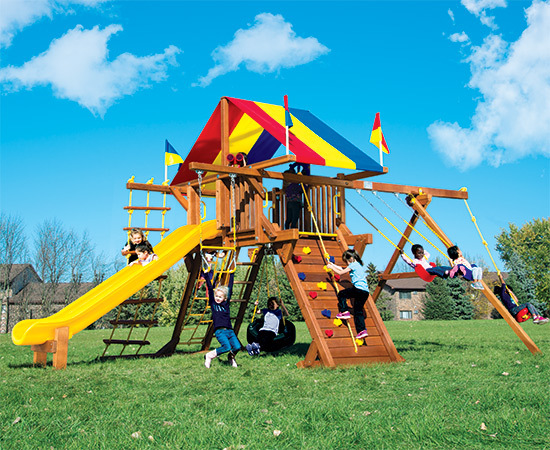 Our Castle swing sets are perfect for any uneven backyard. Explore our Castles and their unique ability to accommodate almost any play area. From the modest Fiesta to the monstrous King Kong, our Castle swing sets come in multiple deck heights and sizes. Pick the perfect swing set size for your family! The Fiesta Castle swing sets have a 5’ deck height, 8’ swing beam height, and 5’ x 5’ deck size. The Fiesta Castles are a fantastic entry level Castle swing set! The Carnival Castle swing sets are the next size of Castle with a 5’ 6” deck height, 8.5’ swing beam height, and 5’ x 5’ deck size. The Carnival Castles are part of the best bang for your buck series! 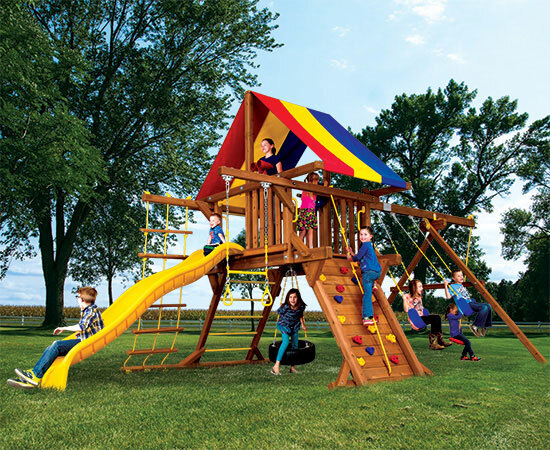 The Rainbow Castle swing set boasts a 5’ 6” deck height and 8.75’ swing beam height with plastisol dipped steel components. Great for families with multiple kids, or many friends! 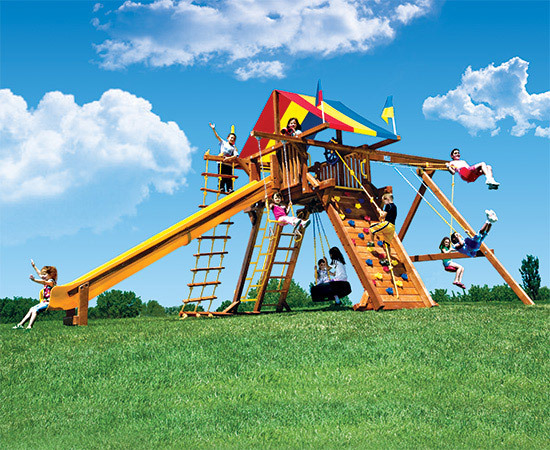 The Monster Castle swing set was designed for the families looking for something even larger than the Rainbow Castle. Coming in with a 6’ deck height, 9.5’ swing beam height and 11’ slide length the Monster Castle is definitely a hit! The King Kong Castle swing sets are the perfect statement pieces for your backyard. With a monstrous 7’ 2” deck height, 10.5’ swing beam height, and 15’ slide length it’s the swing set for the big kids!